I took up this CD with great eagerness, and I was still surprised by how good it is. 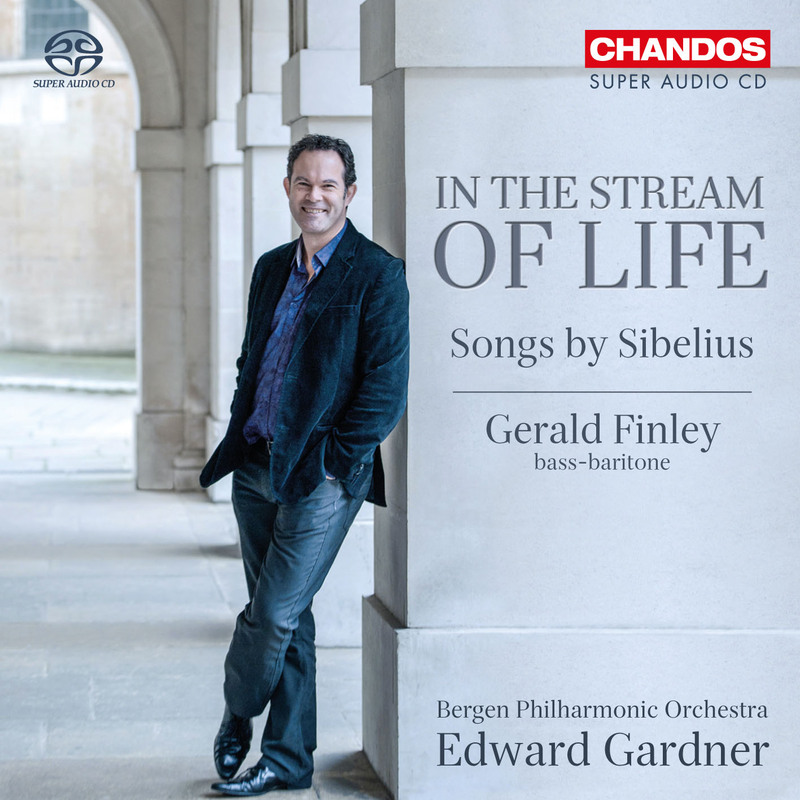 Gerald Finley's new disc presents orchestrations of Sibelius' songs, focusing on a cycle of seven, In the Stream of Life, compiled from Sibelius' extensive song compositions, and orchestrated by none other than Einojuhani Rautavaara. That Finley's musicianship was superb throughout is hardly something that needs saying, but it is something that deserves emphasis. In a historical moment when, with some justice, sensationalist marketing strategies of opera singers are deplored, it is refreshing as well as exciting to be drawn in by Finley's unfussy, utterly mesmerizing singing. Especially in these gray winter days, it makes addictive listening. 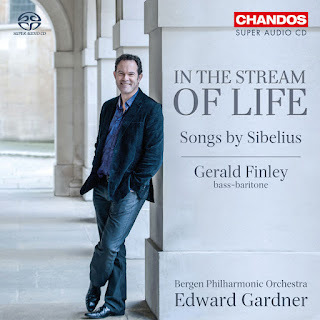 Edward Gardner and the Bergen Philharmonic Orchestra are superb, and they get a chance to shine independently of Finley's baritone in Pohjola's Daughter, The Oceanides, and the Romance in C Major. Not only is it a treat to hear the orchestra on its own, but it enriches the disc considerably to have Sibelius' own orchestral writing alongside the orchestrations of his songs. The orchestra plays thrillingly, with detailed attention to tempi and dynamics allowing the nuance of Sibelius' music to emerge within its grand sweep. Credit, I am sure, is due to the sound engineers as well. From dense crescendos to delicate harps (and sometimes harps within dense crescendos,) the differing textures of the orchestra emerge clearly. On first listening to the CD, I thought for an instant that Finley had, by some alchemy, enabled me to understand Finnish. But the first song of In the Stream of Life, "Die stille Stadt," is a setting of a Richard Dehmel poem. It is exquisite, ethereal, darkening to unease only at its conclusion. Finley's phrasing is gorgeous, and his use of text impressive; "ein leises Lobgesang aus Kindermund" is simultaneously enthralled and utterly unsentimental. Throughout the cycle, Rautavaara's orchestration fascinates, spinning out tension expertly. Dynamics are used thrillingly, as are shifts in instrumentation--for instance, from strings to chimes. More than once, Finley's voice is left alone, to explore or to caress a phrase. I loved how Rautavaara follows Sibelius' refusal to divorce romanticism and modernism, while using orchestral texture in creative, contemporary ways. The second half of the disc, while less interesting (to me) in its orchestrations, contains equally impressive music-making from Finley, Gardner, and the orchestra. A standout is the hushed, involving "Hertig Magnus," in which Finley employs piano singing to remarkable effect. In keeping with the arc of the Rautavaara set, and the theme of the disc, the latter selections darken in tone, with the pantheistic yearning of "På verandan vi havet" and the meditative "I natten," both settings of Rydberg poems. The last song on the disc is, appropriately, a setting of Shakespeare's "Come away, Death" (originally embedded in what is arguably Twelfth Night's most fascinating scene; but I digress.) From almost the latest work on the album (Op. 60, written 1909), "Kom nu hit, död" is haunting, the strings suggesting the tides of the sea that is never far away in Illyria. Finley imbues the hypnotic ballad with something like mysticism. Welcome, wandering Amneris, and thanks for commenting!